If you’re looking for a possible good deal this weekend on comics, you might want to check out Diamond International Galleries new auction site, DIGAuction.com. They’re having their first, week long auction right now and the bidding ends tomorrow. Early issues of the Avengers, Fantastic Four, Thor, Captain America, Spider-Man and more at really low prices because not a lot of people know it’s happening yet. Some of the books are even CGC graded and currently going for less than the cost of grading. And it’s not just Marvel titles, there are issues of Detective, The Demon, Green Lantern from DC and even Get Smart and Hogan’s Heroes comics. I see some issues of Kamandi: The Last Boy going for $1.00 each. All the auctions end Saturday April 14th. So, who is Diamond International Galleries? According to their webpage they were founded in 1994 to “promote and educate the public about pop culture collectibles, boost prestige with events we have hosted, and help collectors find the items that really interest them the most.” That changed a bit in 2006 with the opening of Geppi’s Entertainment Museum. “While DIG remains focused on the sales and marketing of vintage to current pop culture collectible items, we have passed the educational functions of these items along to GEM.” While they have been using eBay to list 600 to 800 items weekly, they are slowly transferring those sales to DIGAuction.com and will be doing more weekly auctions like the one going on now. 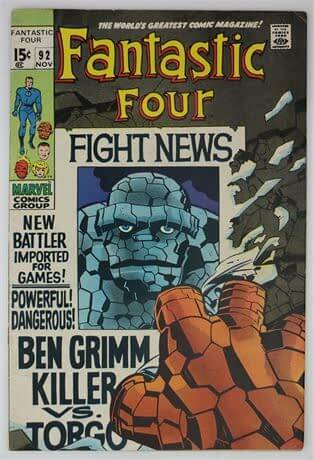 There are some seriously low prices on over 250 comics up cor auction. Well worth following this link to take a look.